A weirdo tutorial on how i did build up that base can be found behind this link! He is also up to CMON! Bust before breakfast, day 4....sunday. DEATH !!! About an hour again, it took me a while to upload the pic as I had breakfast later on at my parents. Sry for the bananaish foto quality but it still was pretty early. Thx for taking a look, have a nice sunday ! I love painting, i guess you all might know this. 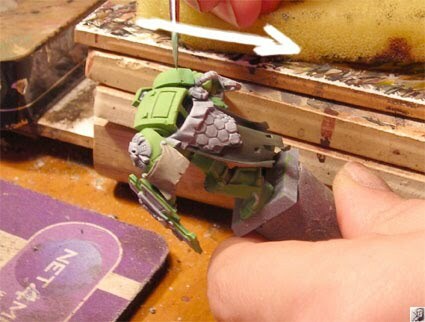 I also loved to draw with pencils but have lost it on track while painting miniatures all the time. Last weekend i was sitting by a friend and did a little sketch again... nothing special but i did hold a pen again - yeah! The actual email adress is now found here! 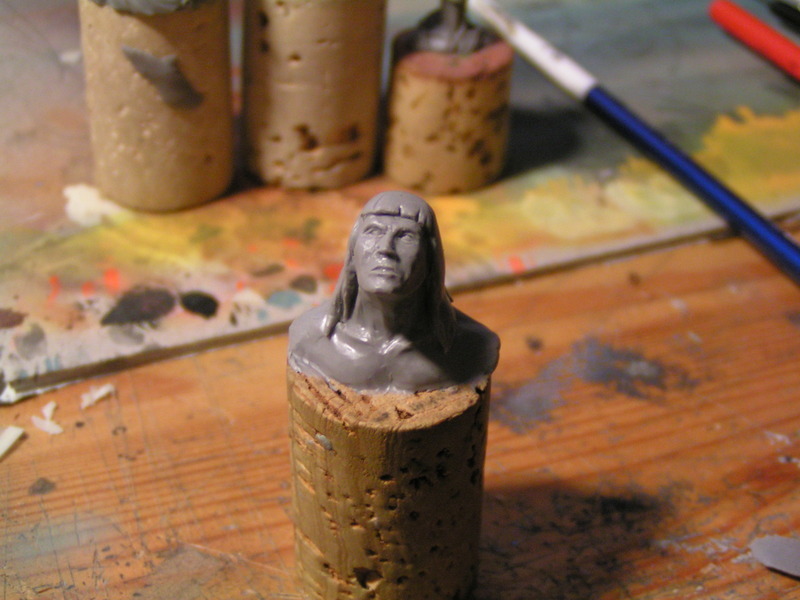 Hello friends of the jungle, here is a little basic step by step on how to sculpt a quick sketch bust. At first, start with wire as always. Cover the wire with green stuff. 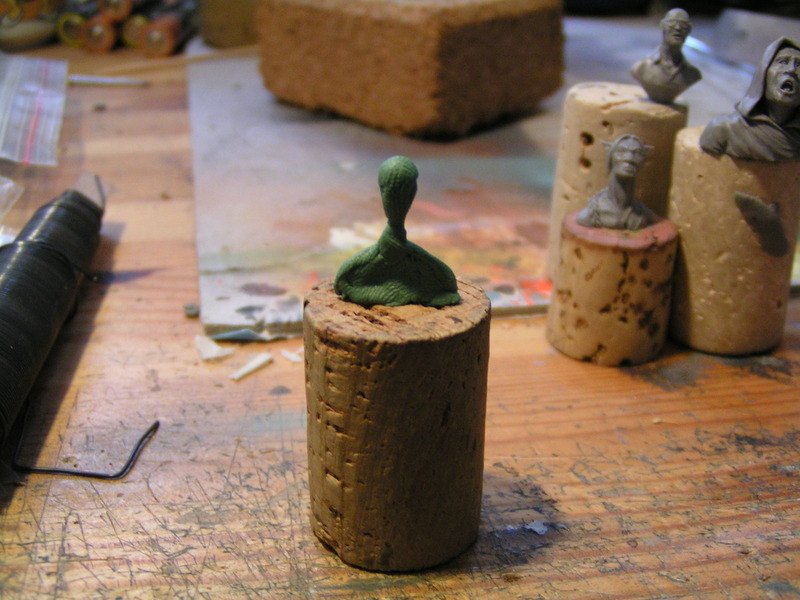 The green stuff will act as adhesive for the sculpey. 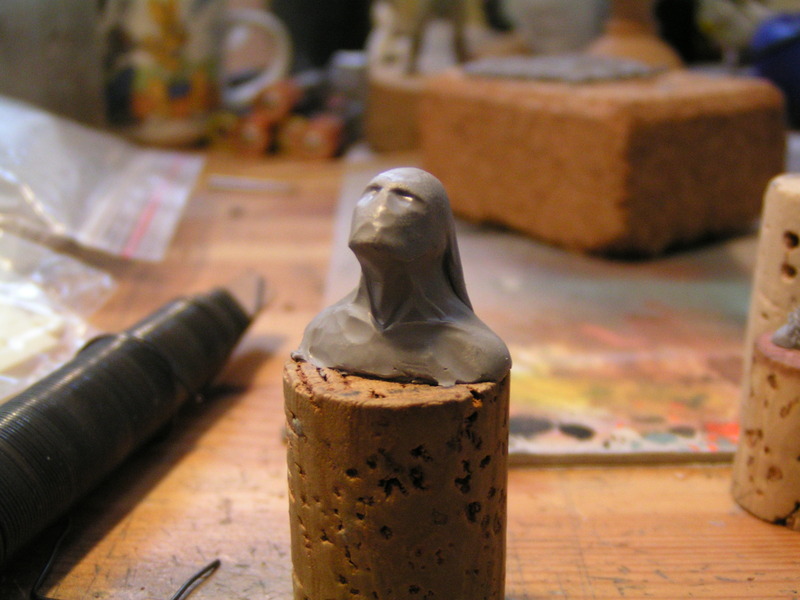 The next thing is covering the green stuff with super sculpey. No need to worry too much about precision yet, this is only a base of material to work on. 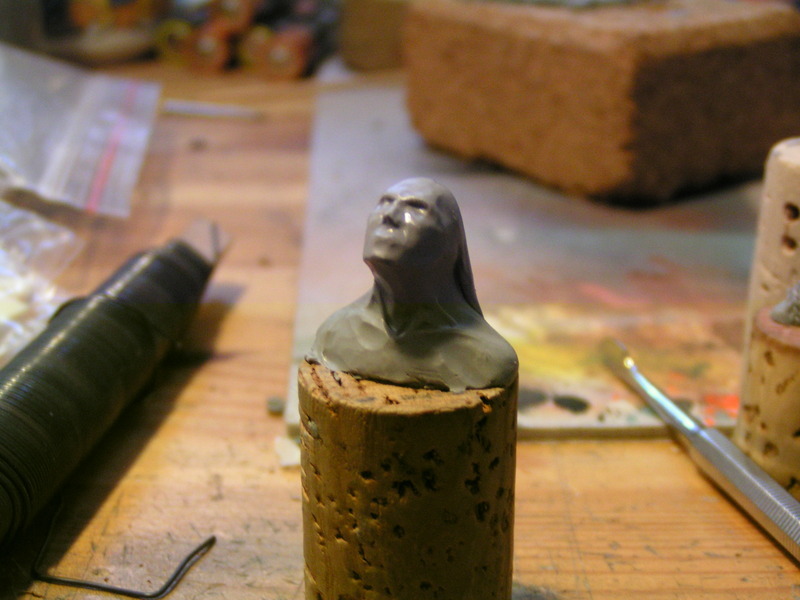 Start giving it the basic forms you want your sculpt to have, very basical, don't concentrate on too much "detail". Basic forms are essential for you as a reference on where to put what in the face. 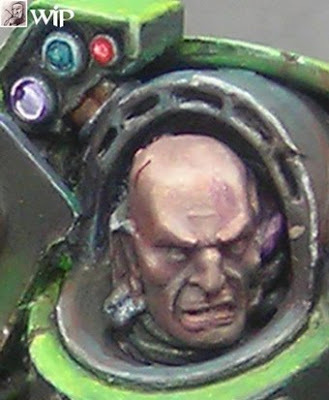 I like to start with eyesockets to mark to middle of the face. 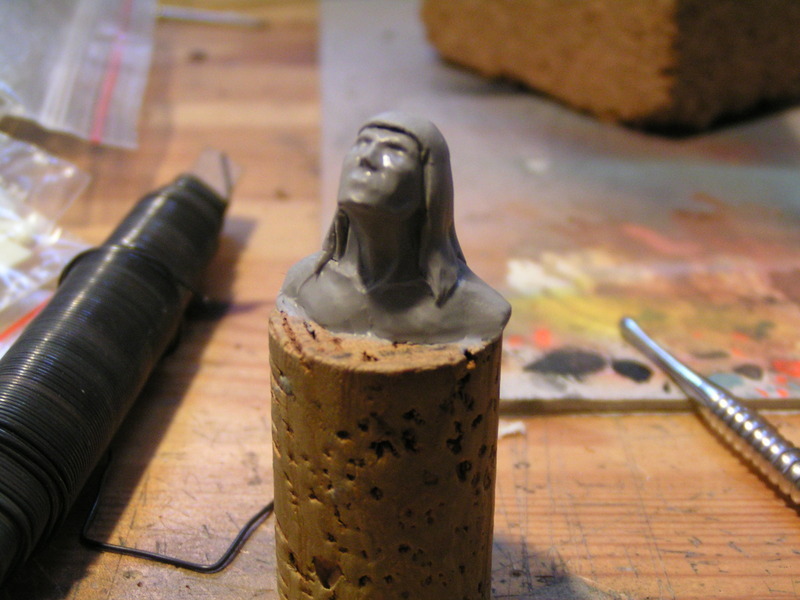 I make them by pushing my tool into the putty and at the same time building up a little material for the nose. With a round movement from the cheeks to the nose I build up more nose material. I start building out the mouth area a bit. 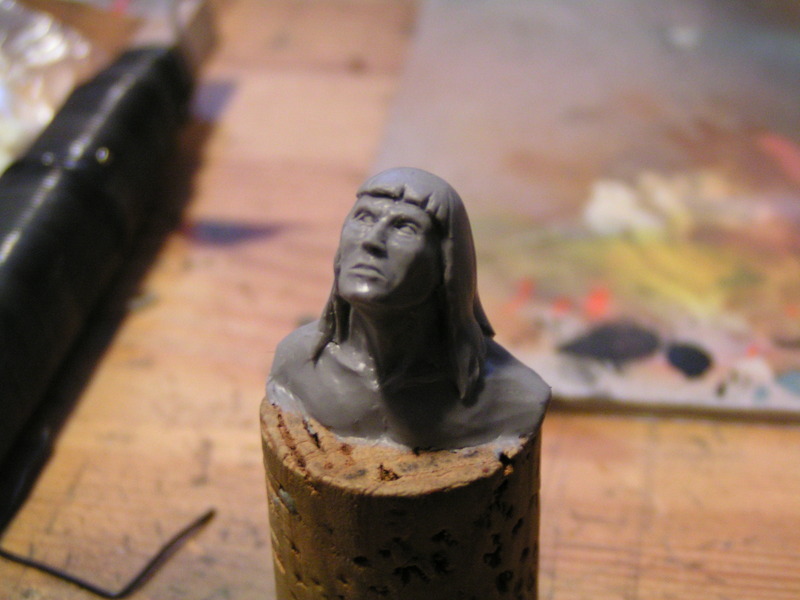 Here I added a little piece of hair and built out the basic volumes of the chest. Changing the volumes of the face a little adjusting it to look more like a face than mashed bananas. A few corrections here and there. A little more work on the mouth area and generally a little bit more of detailing in general. Till here this took about 40 minutes, the basics are done. From here on you can start detailing the face, hair and chest as you like. I didn't bother as this is intended to be a quick sketch. Sorry for the crappy pics, I hope you enjoyed it anyway. In the upper horizontal navigation bar you may find the new changes. 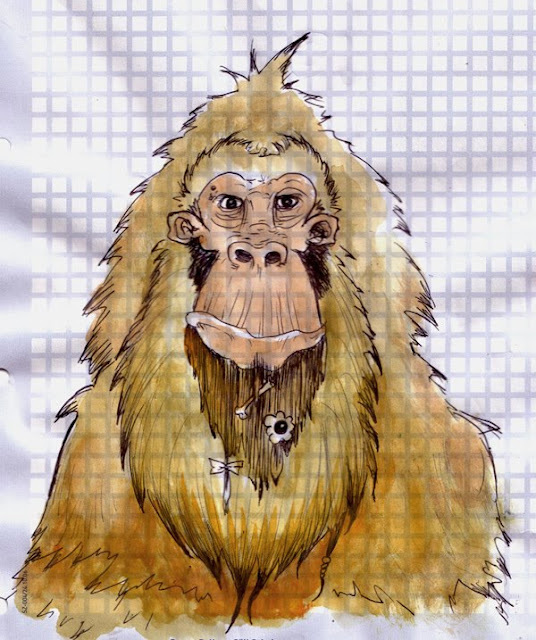 Raffa did an excellent job here for those of you browsing MASSIVE VOODOO from their mobiles and other things i don't understand because of my old grown silverback. You may now click on the main categories, for example "Articles" to get directed to another version of the menue. Check it out! If you don't understand what i am trying to tell you here, let me know via dropping a comment. Thanks to Raffa... rock'n'roll baby! Inspired by my buddy crownbears blog-project "a bust a day" and Raffa telling me to work more I thought of starting a little project myself. As I am up pretty early everyday I thought I'd make a bust before breakfast everyday and try to keep it under an hour in crownbears tradition. It's been three days now and I must say I enjoy it a lot. On the second day I did "the avatardude", made it as I remembered from the movie, didn't bother 'bout references here. 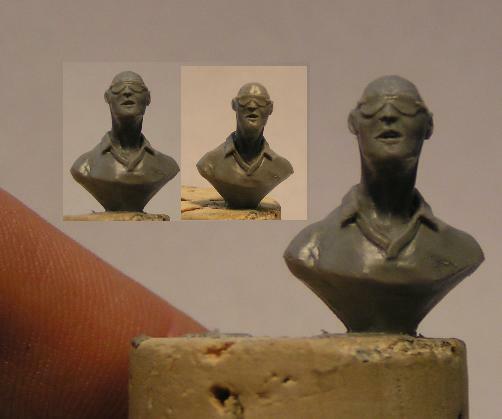 On the third day I did "polopimp", no concept and quite rough, I'll try to take better pics. All were made in about an hour +/- 15 minutes. Materials of choice: wire, green stuff, super sculpey firm, tools, bananas. Thanks for taking a look, may the bananas be with you ! Today I bring you the morning sound of saturday, thanks to raffa for showing me this track ! have a nice day people ! 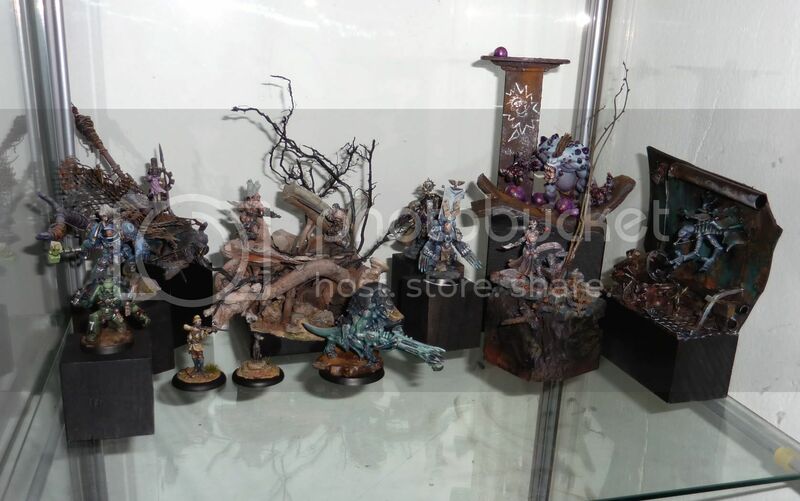 If you are intrested in the Genestealer (Diorama / Scene) feel invited to follow this link to ebay! Hope you like him! He is also up to CMON! Keep on happy painting and may you all have a wonderful weekend! Good morning world and a big thanks to Jimmy Hendrix for the kiss he gives me every day. Sometimes beauty and grace is the same - Kong simply loves woman... there is big beauty good and in the beginning of the video there is jungle - big good, i like. I had a closer look into my cabinet and found this miniature. In my opinion it fits very well to the "Little Angels Charity Painting Contest" - that's why it is on ebay now. All proceeds from this auction will be donated. As mentioned, here goes the first one up to ebay! May he find a new blessed home! 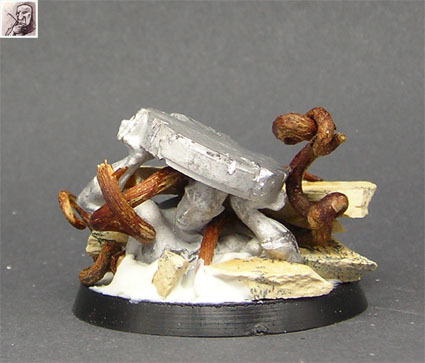 The base is scratchbuild on a faboulous socket by the sockelmacher.de, added some Hirst Arts pieces and roots to it. The statue is from Rackham. I messed up that socket again, haha. I hope you like him! He is also up to CMON if you want to drop a line there or just make a vote or do whatever you want at the place that waits for you behind this link! He will soon go up to ebay, if you are intrested in it before it goes to electronical bidding drop me a line here! Cheeriiiooo! Jeppa i am a fool... can't stand it. Denise rubbing at my neck i have another long time WIP finished. A Genestealer breaking out of a wall. 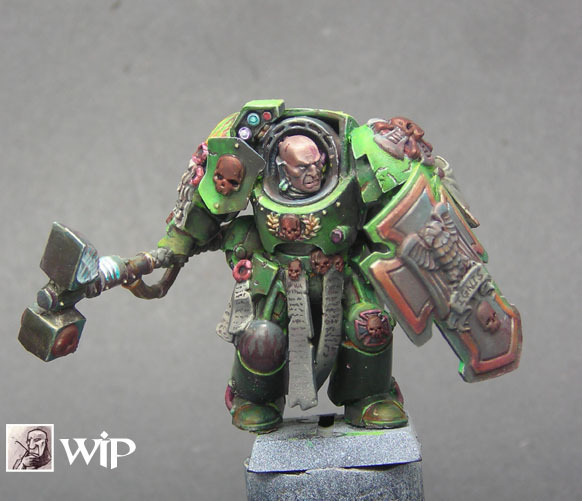 Model is from the limited Space Hulk Box. 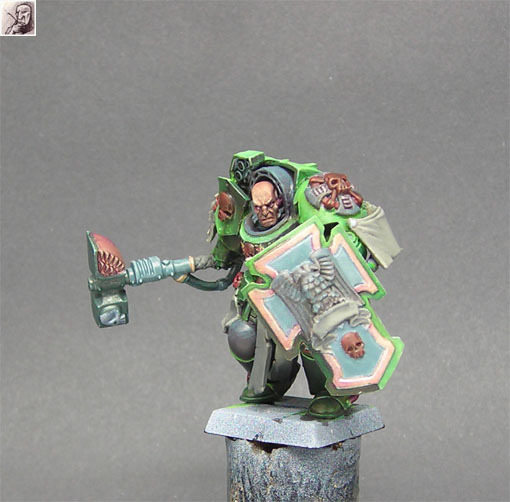 A tutorial on how i weathered the base can be found here. 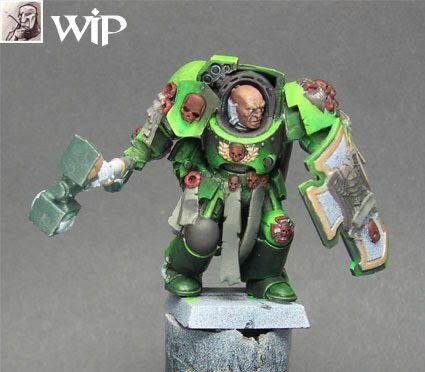 Some WIP-Shots are found here. Hope you like this little scene! It is also up to CMON if you want to leave a vote there - klick! It will soon go up to ebay, if you are intrested in it before it goes to electronical bidding drop me a line here! 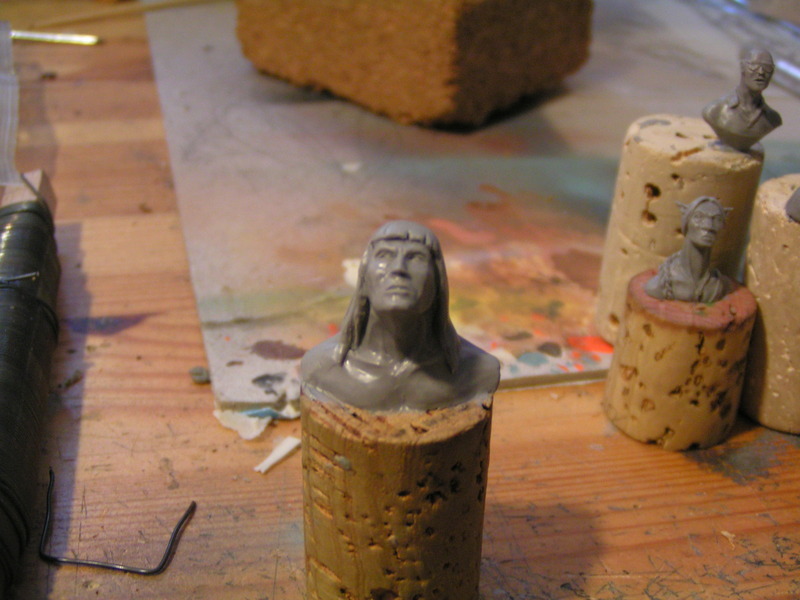 A couple of weeks ago I tried to sculpt pillars but it wasn`t quite successful. 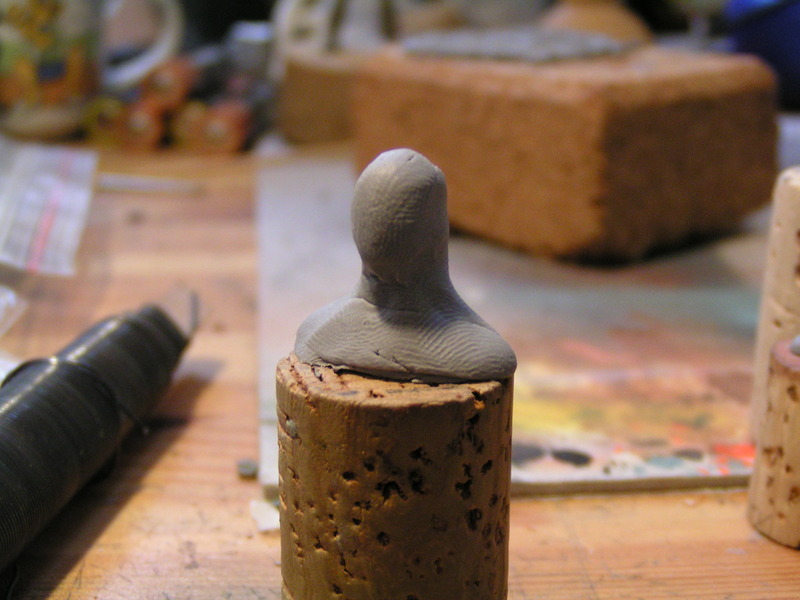 I used Fimo and the sculpey was soft all the time and I really had problems to get them regular. Then my Monkey Brother Mati helped me out :-) Thank you at this opportunity. He told me to use Milliput for the middle part of the pillar because it is possible to cut and sanding the Milliput after it is dried. I did and got at least one pillar finished in one hour or so. It is not perfect, to be honest it is wry,lol. But it is okay for a very quick job and it is good enough for the moment. 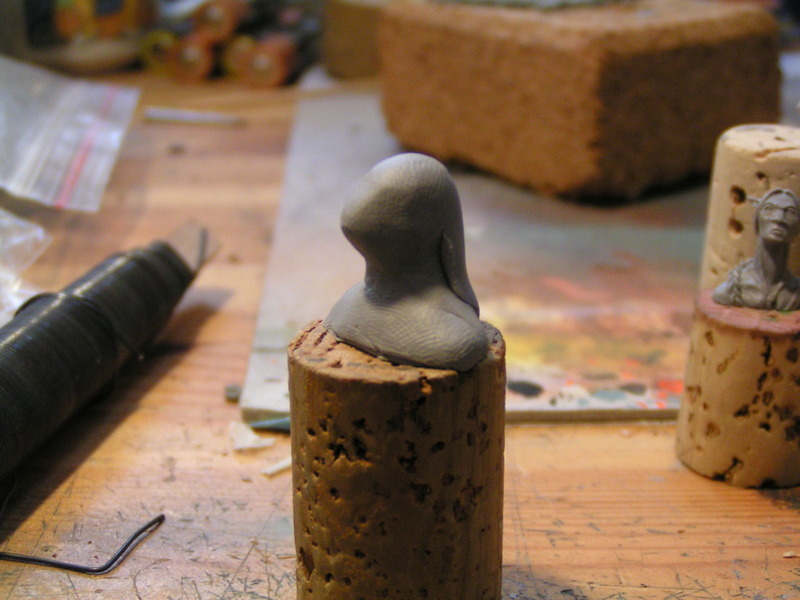 I will try to sculpt the perfect pillar when I will cast them but for the moment a half perfect pillar is good enough. 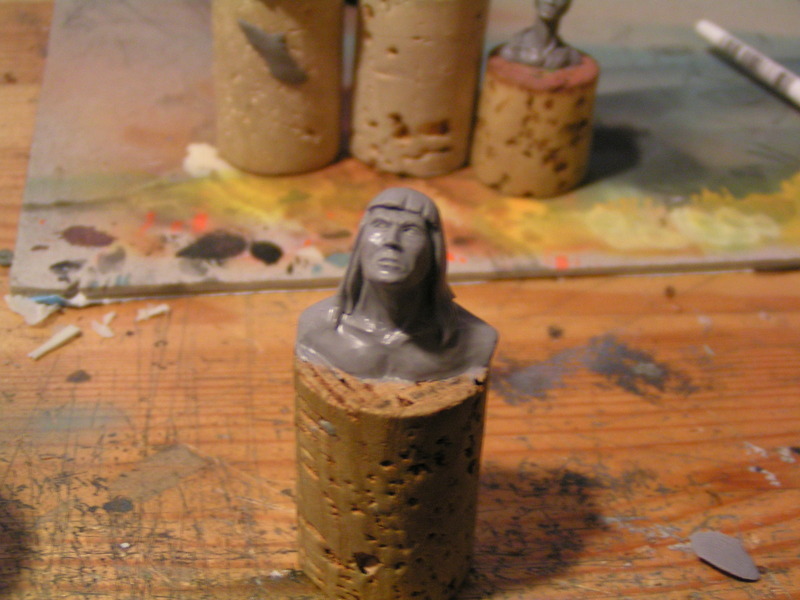 The problem is: To sculpt perfect pillars take a lot of time and time is something I don`t have got at the moment. But if you like you can try to make it better than me. 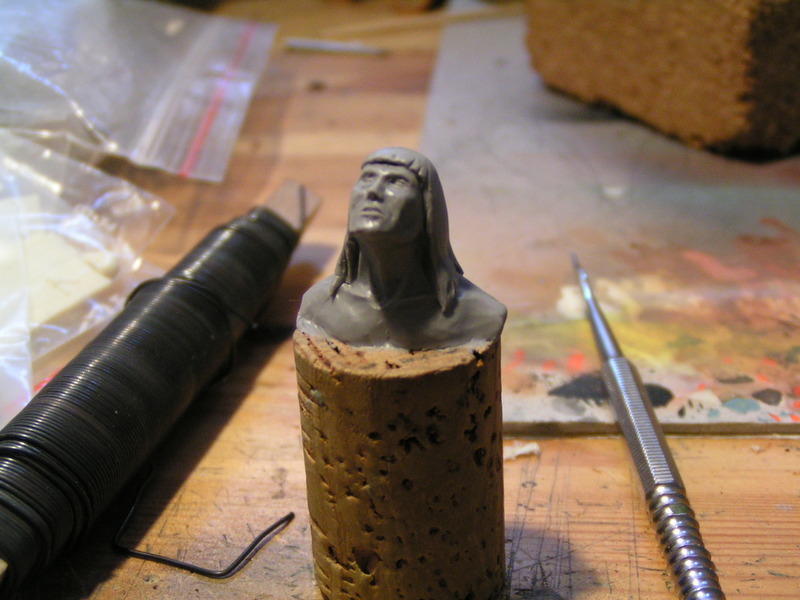 Here is the best way of sculpting pillars I could find for the moment. If someone have got some helpful ideas in addition I would be glad if you would tell it here. Here it is: First I put some Milliput around a wire and rolled it to this sausage shape (took only a few minutes) and let them dry over night. 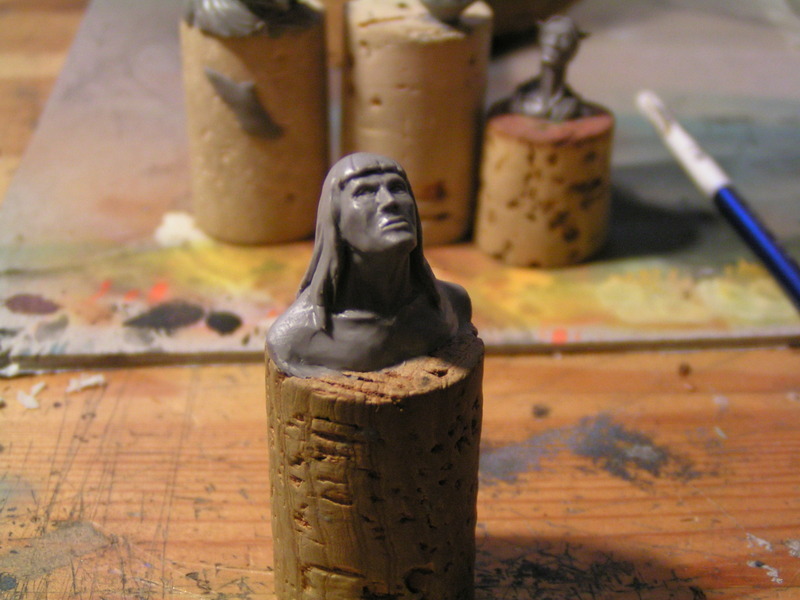 Then I cut the tip of the pillar for to create a kind of a ruin pillar. As Roman is ill I will try to compensate with some spam. A brandnew scratchbuilt right out of the MASSIVE VOODOO laboratories. That's what happens when Roman gets ill. Good thing he had a great italian nurse to take care of him. I just say: They did it again! Found this over on facebook and it totally makes BOOM in the jungle! After the snow comes back these days and outside is really cold, i decided to take a warm coffee and try to pick up translating some old tutorials of mine in english again. 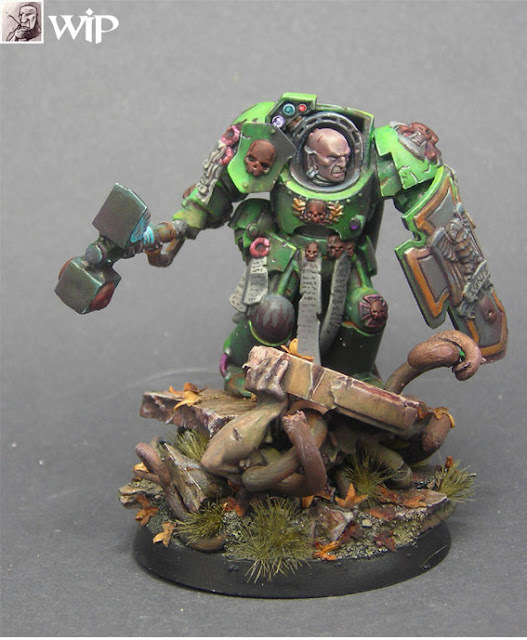 It all began with one of my favorite miniatures ever. 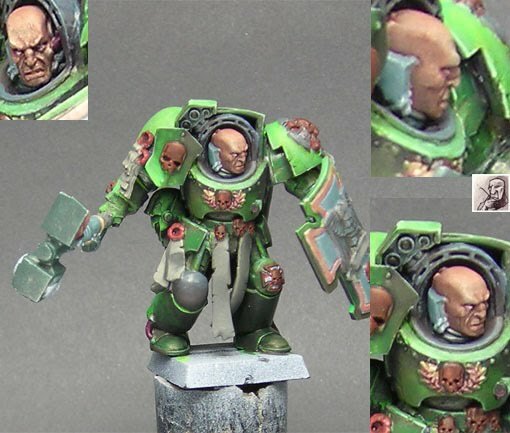 A Space Marine Terminator painted up by vincenti - this model is still one of my favorites and i love every single spot on him. 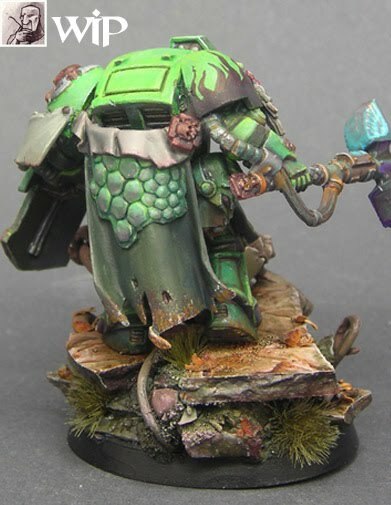 I am not able to find the model anymore as the listing on CMON seems lost. 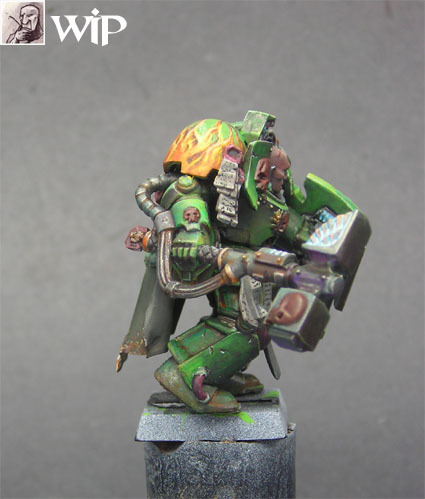 Oh damm... ok, i got inspired to start my own Salamander Terminator by vincenti, thanks for this great inspiration again. I've tried to catch a pose of the marine while he is advancing into battle. 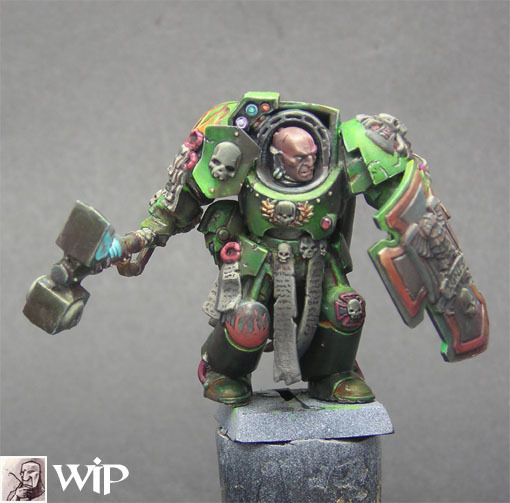 The model itself is build from parts of the Warhammer 40.000 Assault Terminator box. 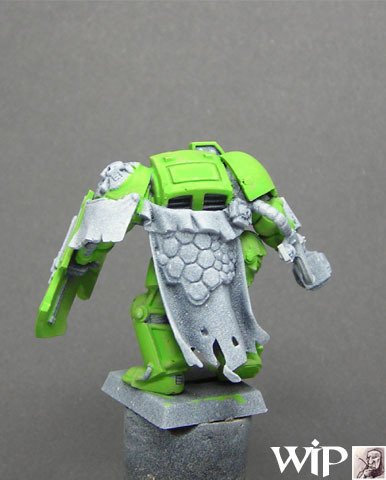 The cloak on the back is from the Warhammer Empire General (Plastic Sprue). 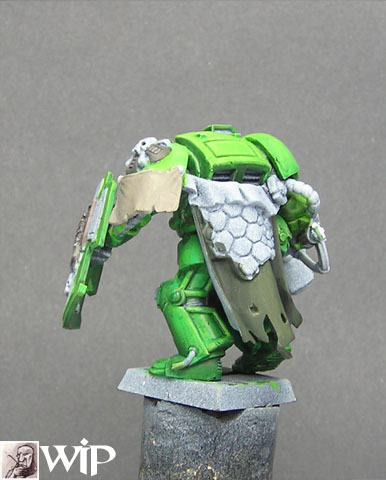 The 2 belts at the front are cut off a plastic Khemri Standard and glued to the model. 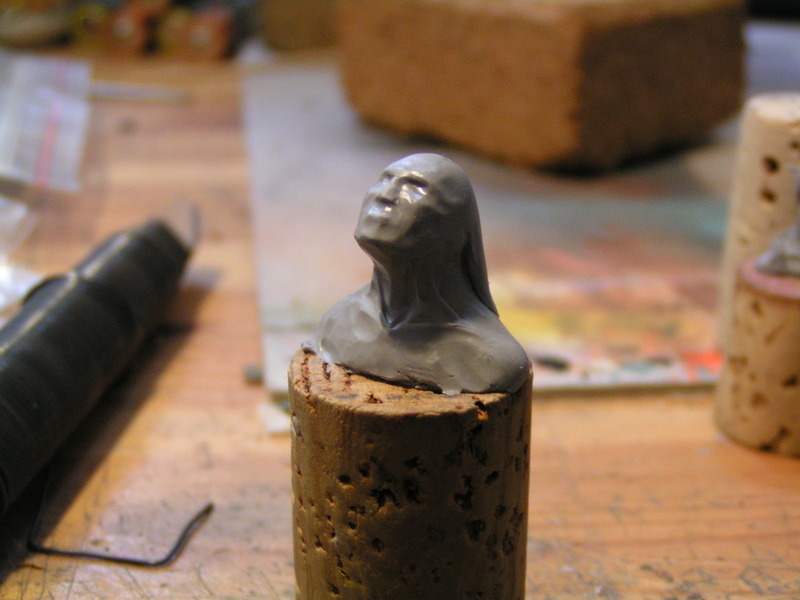 I put the model up to a cork from a wine bottle to have a better handling of it during the painting process. More information? 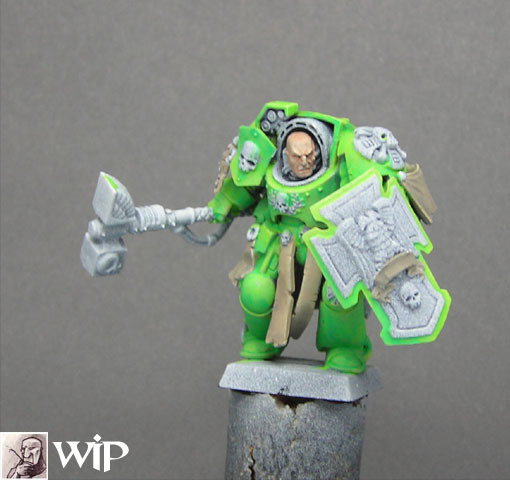 The model has been primed using the 2K-Priming method explained here. Looking at my pictures i have to say that i went a bit too much into pure white these days than i would do today. 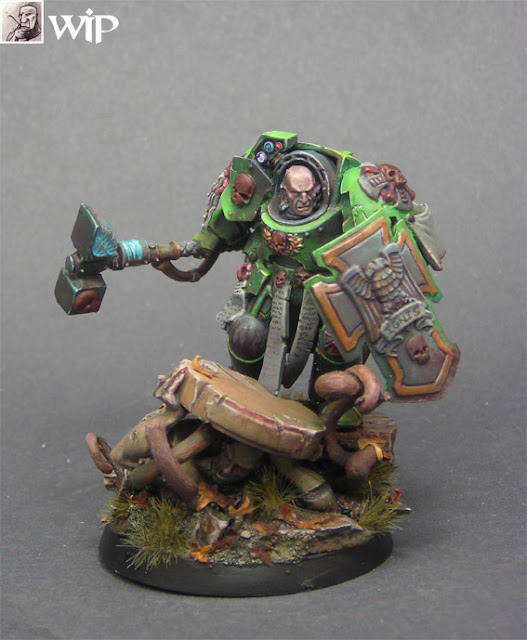 I like to paint models up with a light coming from straight above them. It helps me to know where i put my light and shadow areas in the end and makes him look kind of realistic when he is influanced by a light from above. 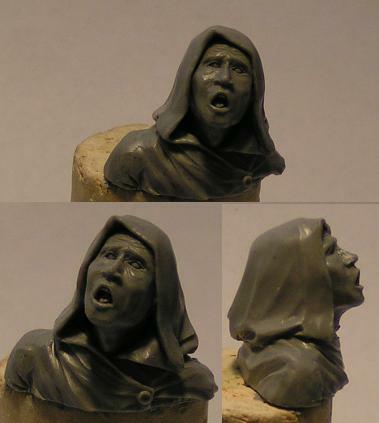 It also sets the focus at the upper areas of the model where you can find the face which is often the most characteristic place at a miniature. I just think to myself that there is a bulb of light above the model - for sure it isn't there - but my thinking is so strong i can see it in due the experience of doing this very often. 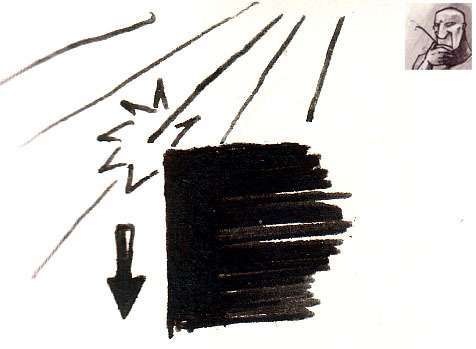 If you are intrested in the theory of light check this article! Important to me is that i already try to focus a complete light situation to the model. 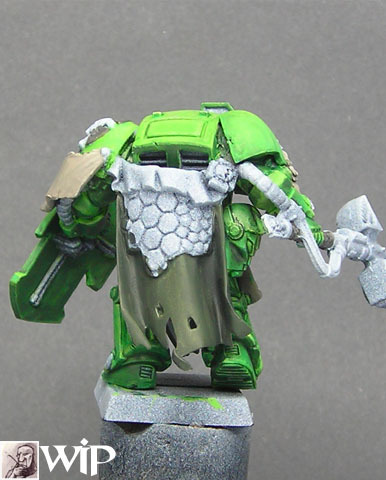 I want the legs and lower torso less bright in its colours than the upper areas (light from above). I'll keep that in mind already at these first shadows. Higher means bright colours, lower will get dark. Bad picture i know, but you will get what i try to explain here by the further shadow work on the miniature. 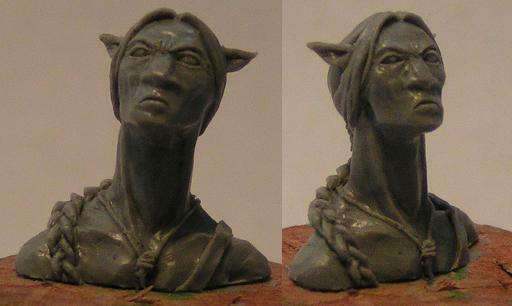 I also added other basecolours, for example Elf Flesh/Graveyard Earth for the facial skin (50/50). The pergaments where made with this mix but with an additional tiny tip of Chaos Black in it. 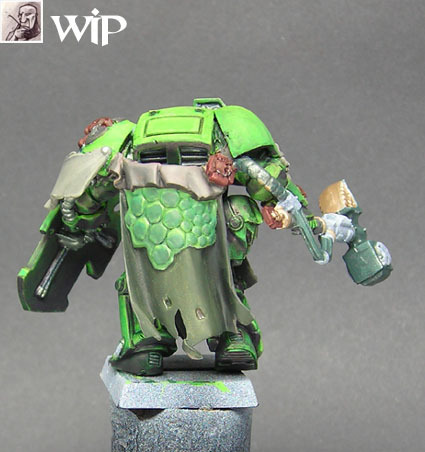 The cloak on the back was done with a mix from Catachan Green and Chaos black. 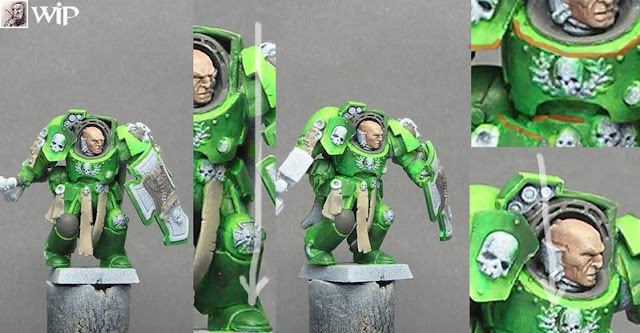 The model looks like this with these first gentle shadows on the armour - really gentle - check out the article about using glazes again, there have been some picture updates made - here! With this knowledge i bring in a strong bright edge with a shadow besides it by using a glaze of my second shadow colour tone mentioned above. I have marked the edges where i want the light to hit hard with orange in the following pictures. Always thinking about the light from the top and where i put my shadows. The face did get its first shadows by bringing in Chaos Black/Scorched Brown/Fortress Grey, ca. 50/30/20 in the basecolour of the skin. 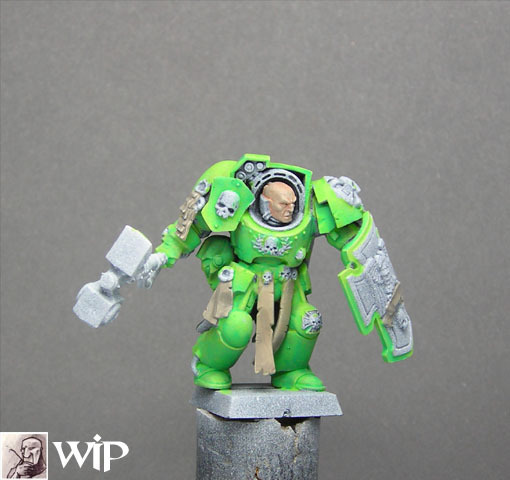 I also used this colour mix without the skintone to paint the basecolour of some additional armour parts. 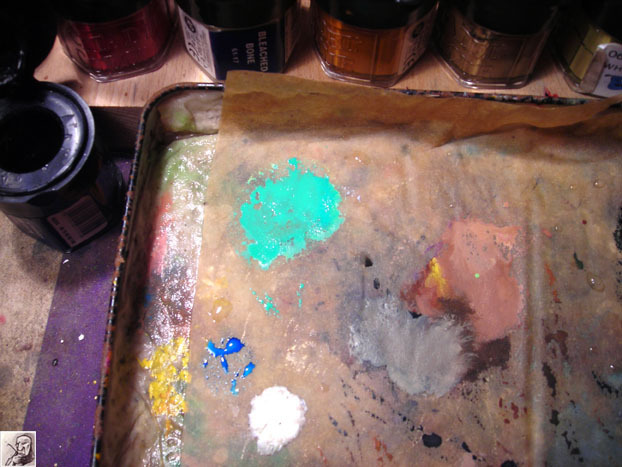 Next steps have been the decision where to put metallics and what colours i use for them. 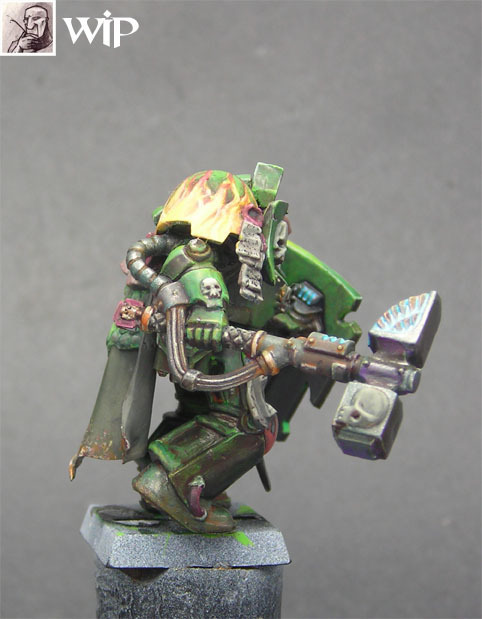 If you are intrested in some thoughts about working with metallics, check this article! 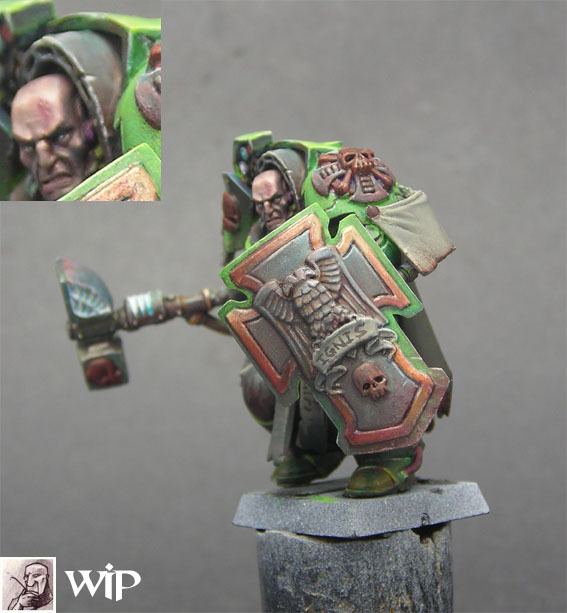 All skulls on the model became a basecolour done from Schorched Brown. 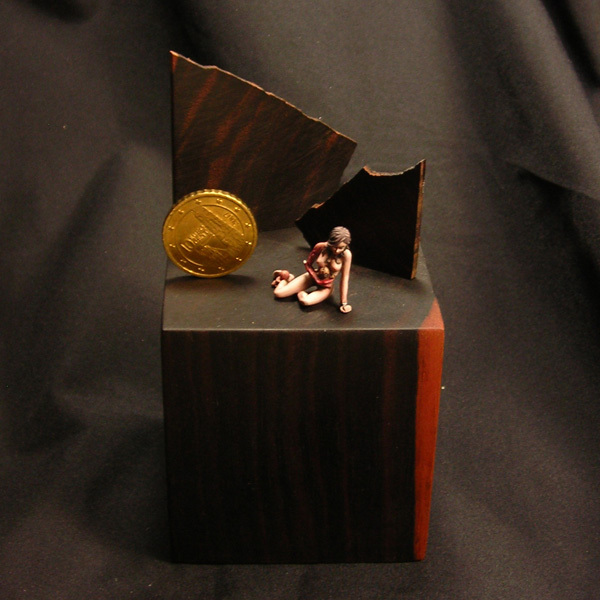 The pergament was worked to its first shadows by using Bleached Bone + Chaos Black. The face got several thin glazes of Scorched Brown to intense the shadows in it. The eyes have been painted black, followed by white. More about eyes is planned in another tutorial. The upper cloak part was made from a mix of Vile Green/Bleached Bone/Chaos Black/Deadly Nightshade. 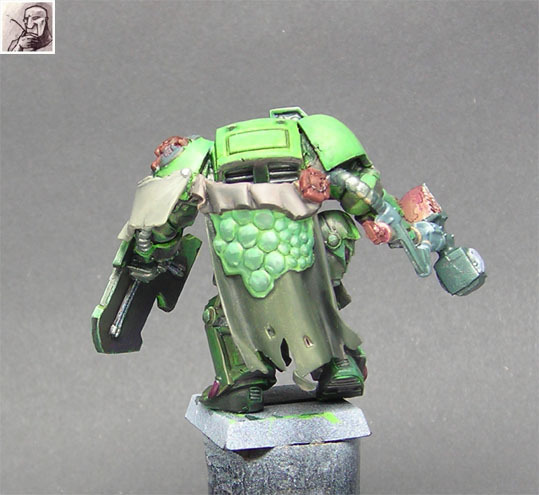 The areas of the armour where the light hits the most have been intensed by using the basic armour colour + Ivory (Vallejo Model Colour / 70918). The dandruffs at the cloak have been done with a various mix from the colours above to bring in some shadows by glazing. 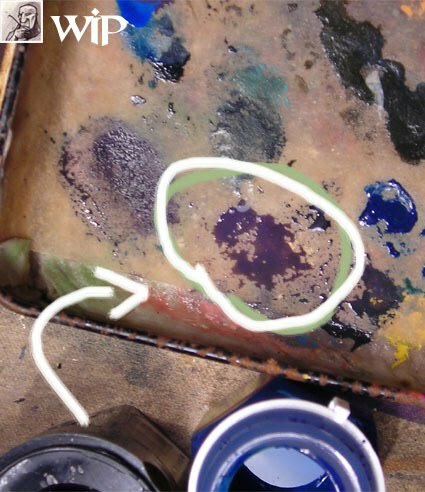 The facial eye area was gently glazed with Liche Purple. The golden parts have been glazed with Liche Purple + Teracotta several times. 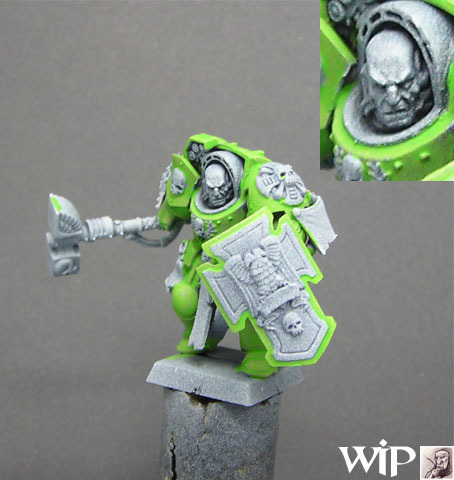 At the grey armour parts a mix of Chaos Black/Bleached Bone/Space Wolfs Grey (ca. 30/20/50) was attached. I have no idea what this might be good for, but big Urang-Utan-King will tell me for sure in the end. I'll try to explain. Brain reset. Think! At the base i chose warm earthy colours. 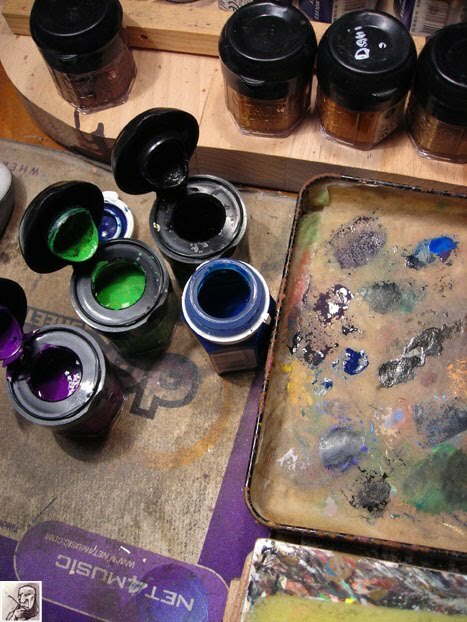 I workded mostly everything up from Graveyard Earth and mixed a lot in, like purple, teracotta, black, catachan green. The sand has been drybrushed while the stones and the statue have been painted normally. 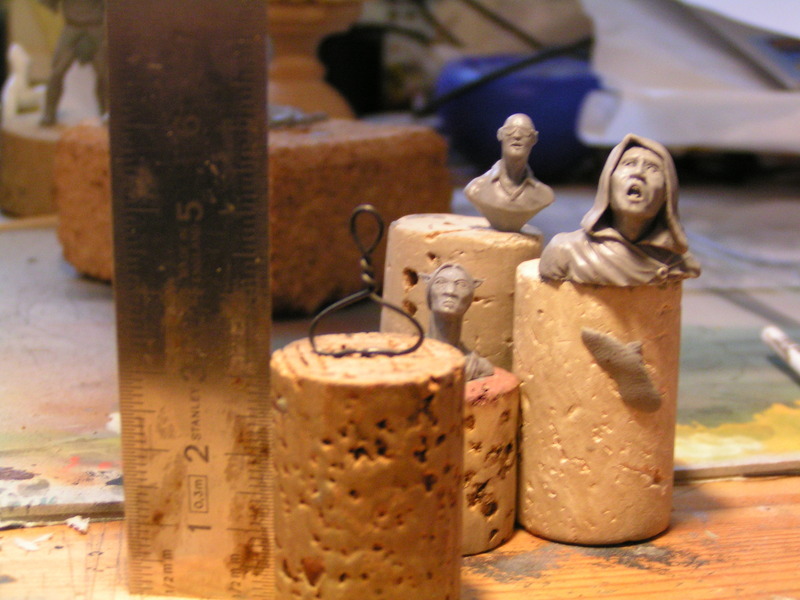 Take a view on the edge/light thing - i always like to put as much attention to a base than i do to the miniature. It makes it more homogenous in the end. The grass i have used here is from the company "MiniNatur" and is really easy to assemble, but there will be another tutorial on how to do so and how you can make it less glued to the base - way more harmonic. Sooner or later. The leaves are birch seeds, glued to the base. You may also get those at PK-Pro if you are a lazy guy. 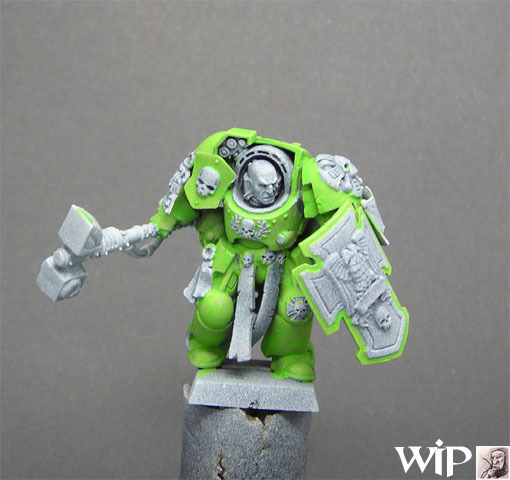 The green armour was strengthen in its lights by using a mix of Bad Moon Yellow and Snot Green (ca. 70/30). Also the shadows have finally got some attention with soft glazes of chaos black + Regal blue (50/50) - somehow an additional drop of Schorched brown in it, don't know why but i used this also in the next places. 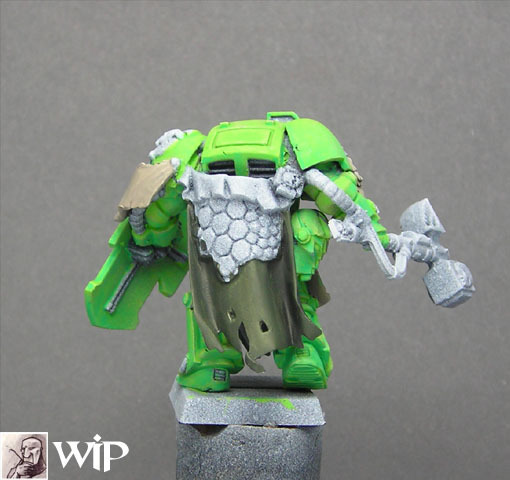 The grey armour parts have been glazed into the shadows by using this colour. The lights have been done by mixing in Fortress Grey and Ice blue in that mix. By using the brown/black glaze i have done a complete darklining on the model, that means i took my time to seperate every single area from the other by a dark line. It is way easier for the eyes to get some more information out of the model when this is applied. It is getting sharper and you have a clearer view on the details. 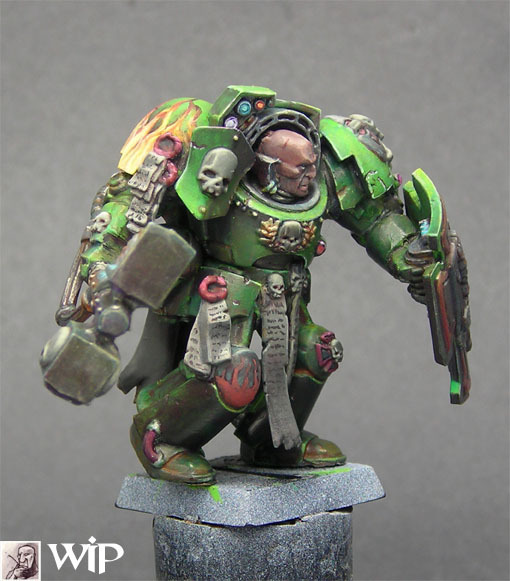 Soft, gently glazes of Scorched Brown to Vermin brown have been used for the weathering on the green armour. I tried to do it not overall - i tried to focus on the idea of "less is sometimes more". The golden parts have been glazed with Bestial Brown about 5 times. 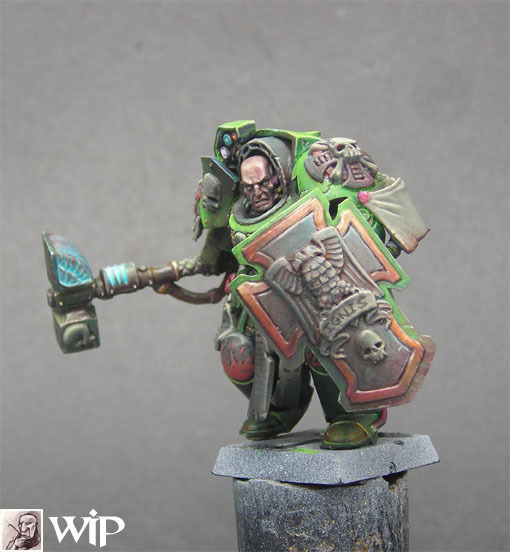 The energy weapon, the hammer did recieve some glazes with pure white, followed by glazes of ice blue, gently applied over the white to make it bright and strong in its energy powers. To make this effect stronger i took a tip of Hawk Tourquise and brought it in by mixing it to ice blue. Carefully glazed this in, concentrating on the deeper spots. From a mix of Scab Red + Chaos Black (ca. 40/60) i started the "Flames" at the shoulder- and kneepad. 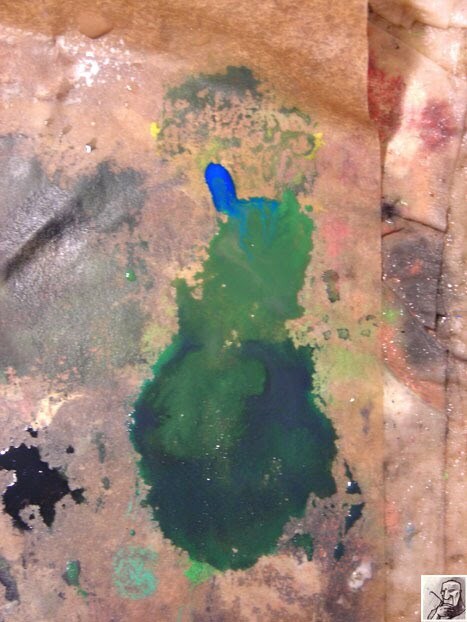 The cloak on the back has been darkened with glazes from a mix of Chaos Black + Hawk Tourquise (ca. 40/60). The dandruffs have been darkend by using a glaze of Purple Liche. 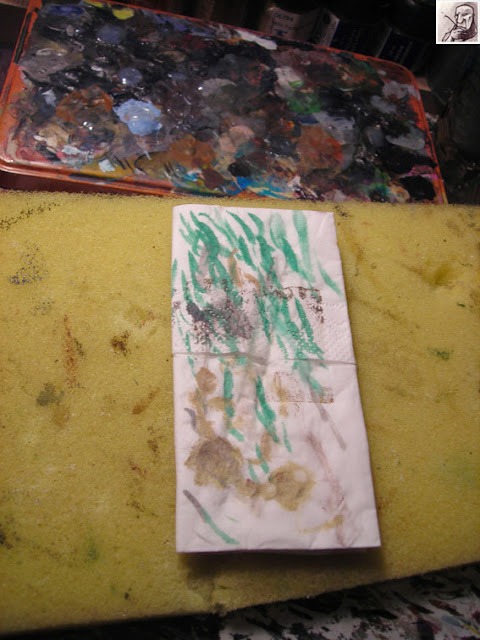 For the deepest cavities i have used the mix of the darklining step, mentioned above. 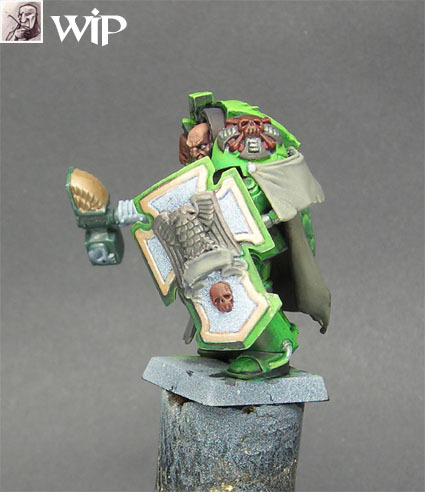 Colours used by the base have been appplied to the end of the cloak to make it look more used. Did the same to the feet. 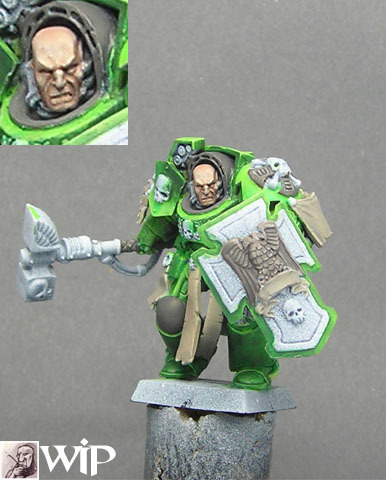 I removed the model from the base again. Yeah i know this might sound very chaotic. I did so because i had no other chance bringing in more details. The eyes in the face have been set with white again. A black pupil was set in both eyes and have been finished with a white tiny point in the black to show the light reflection in the eye. Not completly satisfied with the actual state of the eyes but i'll try to fix this. The golden areas have been glazed with brown/red again while the lights got attention at the edges by using mithril silver additional to the gold base colour. 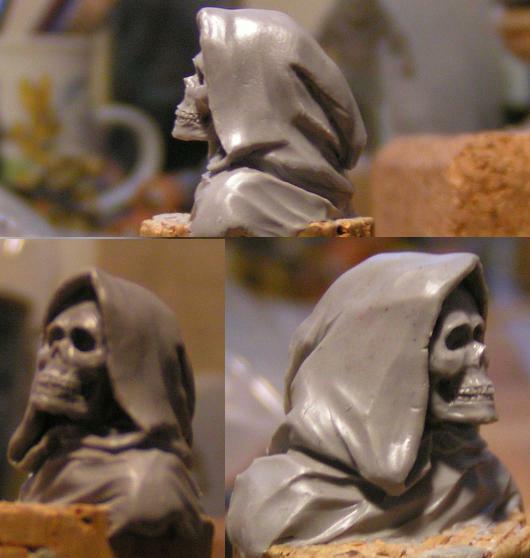 The skulls have been painted with a mix of Fortress Grey/Chaos Black/Bubonic Brown (ca. 50/20/30). Lights have been set with more Bleached Bone in this mix while the shadows have been set with adding Midnight Blue/Schorched Brown to the starting mix. I strengthen the flames by making the green that touches them nearby a bit darker. Now i try to explain my work at the flames using the knee for explanation. 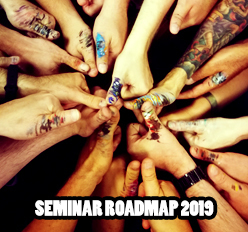 I did start here with a mix from Scab Red/Bubonic Brown. I did set the cloth part on the other shoulder into the lights by starting with Graveyard Earth over adding Bleached Bone. Still no idea what will be up there and i have also no idea why there are pink spots now. I checked the model long time in my hands, viewing it from every angle. I so decided which areas should get more lights and which less. 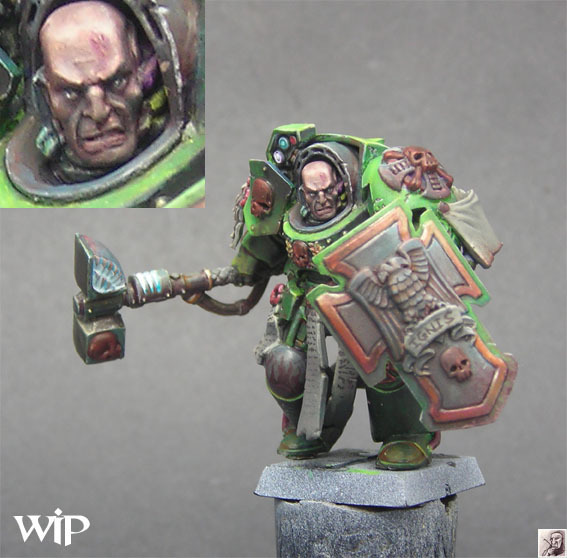 I controlled this over the complete miniature and made some final highlights. I often do the final lights in the end so i can navigate the focus way easier. 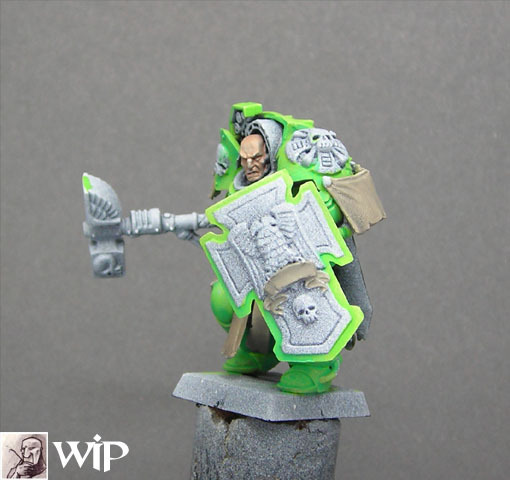 The skulls and the final lights at the armour edges have been strengthen in their lights by using Bleached Bone/Scoprion Green. I checked the darklining over the complete miniature and reworked some places. I also started to play a bit with additional weathering to make this guy really look battleproofed. If life would be easy were would all the adventures be?